Motor vehicle collisions, slip and falls, and other harmful events can derail the course of a person’s life in an instant. When you have been involved in an unexpected accident, you may be able to seek compensation for your medical bills and other costs, as well as the physical pain that you experienced. The injury lawyers at Tenn And Tenn, P.A. are committed to protecting the rights of Manchester residents who have been hurt as a result of the careless actions of others. Every day, people suffer serious injuries as the result of car and motorcycle collisions, workplace mishaps, improper medical treatments, slip and falls, and other preventable events. In many of these situations, a legal claim arises when the accident is caused by the carelessness of another individual or business. Typically, this type of lawsuit is brought under the theory of negligence, which is, simply put, the failure to behave with reasonable care. Although the factual circumstances of each case will be different, establishing a negligence claim in New Hampshire requires proof of the same elements: duty, breach, causation, and damages. The plaintiff has the burden to prove that the defendant owed the victim a duty, the defendant breached that duty, the defendant’s actions were the proximate cause of the victim’s injuries, and the plaintiff suffered damages. Generally, every person has a duty to exercise care and avoid behaving in a manner that puts others at foreseeable risk of harm. However, depending on the type of defendant and the circumstances surrounding the injury, the specific duty, or standard of care, to which the defendant is held will vary. For instance, drivers have a duty to exercise reasonable care while operating any vehicle. A driver breaches this duty when he or she fails to obey traffic regulations and other general rules of the road, or engages in other reckless conduct. In professional negligence cases, such as medical malpractice suits, the plaintiff has the burden to establish these elements with affirmative evidence that must include expert testimony. The victim must therefore prove the standard of reasonable professional care within the defendant physician’s specialty and geographical area with testimony from a competent medical expert. The plaintiff must also present expert testimony showing that the health care provider failed to act in accordance with the standard, and that the defendant’s actions were the proximate cause of his or her injuries. A property owner, landlord, business owner, or other party that is responsible for the condition of the premises on which an accident occurred may have certain duties that correspond with the victim’s status as a tenant, invitee, licensee, or trespasser. 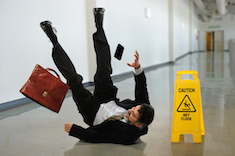 Because of the fact-specific nature of slip and fall cases, it is important to discuss the circumstances of the accident with an attorney who is knowledgeable in premises liability law. The plaintiff must also prove that he or she incurred damages in order to recover compensation for injuries resulting from the defendant’s negligence. Generally, the plaintiff is entitled to compensatory damages under New Hampshire law, which may include the cost of medical care and expenses, lost earnings and loss of future earnings, disability and disfigurement, emotional distress, pain and suffering, or loss of consortium. In New Hampshire, the statute of limitations for filing personal injury claims is generally three years, although there are exceptions for certain situations. Discussing your claim with an experienced attorney as soon as possible can help you preserve your rights. If you have been involved in a car crash or another accident in Manchester, contact the New Hampshire Personal Injury attorneys at Tenn And Tenn, P.A. We understand that the legal process can seem overwhelming and intimidating. We are available to listen to your concerns and explain your legal options, allowing you to concentrate on your recovery. Schedule a free consultation by calling us toll-free at (888) 511-1010, locally at (603) 624-3700, or completing our online form.